The field proven Rugged Power UPS line is ideally suited for military,industrial, computer and telecommunications applications requiring high reliability, ruggedconstruction, compact size and light weight design. These units are equallysuited for use in shipboard, airborne, vehicular, field deployed or fixedlocations with controlled or uncontrolled environments. The "
The heavy-duty chassis occupies only 3U (5.25") of rack space while delivering up to2000 VA of clean, uninterruptible power. The rounded metal corners and rugged handles, aidin safe handling. Internally, all major components are well secured and electricallyinsulated to prevent damage due to shock and vibration. The optionalmounting kits include flanges that allow use of TAC-4 style shock isolation pinsand bushings used in some racks. The LED arrayskeep the operator informed as to the unit's status including load and battery levels. Thehigh intensity audible alarm can be heard in high noise environments, yet is easilyadjustable to suit quieter conditions. All controls and protective devices are brought to the front and rear panels with critical switches or breakers guarded. Further, all front paneldevices are recessed to prevent damage or accidental operation. Variousoptional power distribution controls are available which mount on the front panel orremotely. The rear panel provides locking connectors for the input and output power. Multipleinput and output power panel options are available. A removable and washable intake air filter and highcapacity stainless steel ball bearing fan provide added protection in both controlled and hostileenvironments. The air is drawn from the rear and exhaust air is diverted out the front vent, with alternateair flow directions optional. The external battery connector allows the safe and easy addition ofextra battery modules without having to shut the unit down.The batteries are maintenance free with immobilized electrolyte and are constructed of flame retardant materials. For more information, see the Battery Technology section. Theunit also operates as a frequency converter, taking 46-440 hertz input and converting it to 60 hertz power. A frequency selection switchis available for those sites requiring 50 hertz output instead of the standard 60 hertz. The Status connector provides an interface with optional computer software providing loss of AC and low battery status as well as remote shut down capability. See the Power Distribution Units section for alisting of stand alone PDUs. 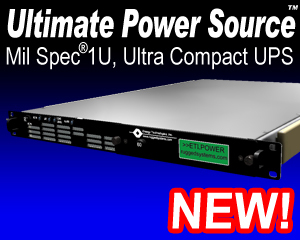 See the N5 Seriesfor a version of this UPS with an integrated PDU and remote control.